Joy knows no better explanation than laughter and song. 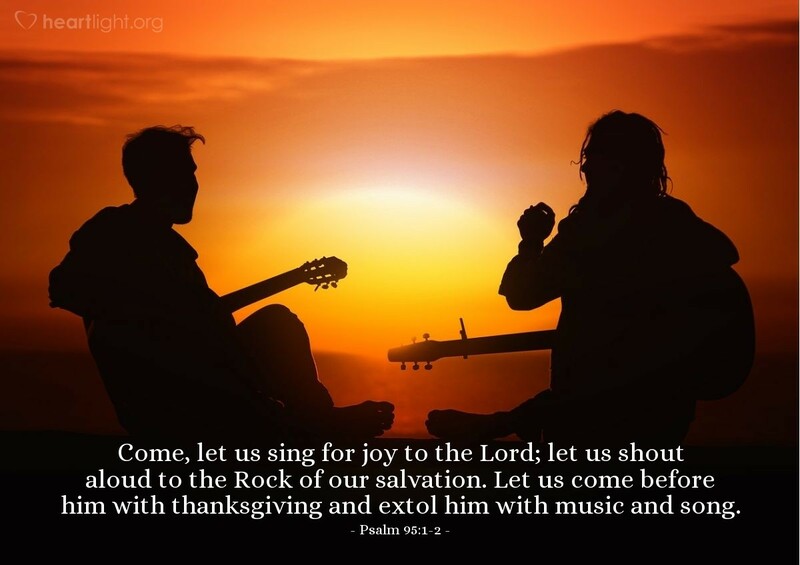 We sing to the Lord because we are joyful! Our music is not inhibited or held back, but exuberant and as full of sound as it is of heart. Thanksgiving brings us into the Father's presence and it is our joy at being saved that leads us to sing. O most wonderful and glorious God, thank you so much for saving me from sin, death, law, and futility. Thank you for saving me and giving me the assurance, through your Holy Spirit, that I can come before you with exuberant and overflowing joy. Your love and grace have not only given me hope but have made me your child. Hear my heart and be blessed by my songs of praise. In the name of Jesus, I pray and will shout your praise forever and ever. Amen.